The Creating-A-Partnership (CAP) Program provides matching funds for Lodges and Chapters to help children in need within their communities. In Fiscal Year 2018, the Masonic Home and participating Lodges and Chapters provided $319,198 in assistance to help nearly 13,546 children statewide. Lodges and Chapters can work within their community to identify a child or children in need through schools or other local organizations. Funds can be used to provide items like school supplies, coats, shoes, hygiene items, and glasses. Lodges and Chapters can identify projects within their communities. Recipients of the funds must be a 501(c)(3) as defined by the IRS or a public entity, such as a school. Funds can be used for projects like a backpack food program, which provides children in need with food for the weekend. The matching funds must go toward the purchase of children’s items, such as food or back­packs. The Masonic Home will not match funds for general operating expenses. The CAP program is not intended to be used as a Thanksgiv­ing or Christmas program. The Lodge or Chapter must submit the application along with their matching funds to the Masonic Home. 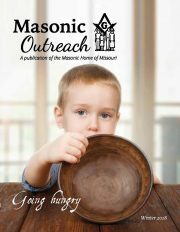 Download the form here or contact the Masonic Home at 800-434-9804. Approved funds will be sent to the Lodge or Chapter payable to the designated store or 501(c)(3) organization. The Masonic Home will not reimburse Masonic Lodges, Chapters, or individual members of a Lodge or Chapter. The Lodge or Chapter must provide a copy of the receipt(s) or a letter from the organization showing how funds were spent. All matching funds must be raised by the Lodge and/or Chapter and the application must contain two members’ signatures, with one being the Worshipful Master, Worthy Matron, Secretary, or Treasurer.